You get so used to listening on a good antenna. I have forgotten just how good the Wellbrook Loop is at pulling in the signals from across the North Sea. Although I am hearing some of the stronger stations on the Tatung / Tecsun loop combination, the weaker stations are being lost in the noise. The laptop charger gives off alarming amounts of RF noise and the sewage pump seems to be emitting noise in this location as well. I have been on amazing walks so far this week in great weather. We have had only a little of the snow that seems to falling toward the east of England. So a very enjoyable stay.. if only I could get the radio reception to be nearly as good as at home! I am away for a few days in the North of England. I heard a few stations this evening using the Tecsun loop antenna and the Tatung receiver (Sangean ATS-803a clone), but IDs were not forthcoming! The only station I confirmed was Batavia. 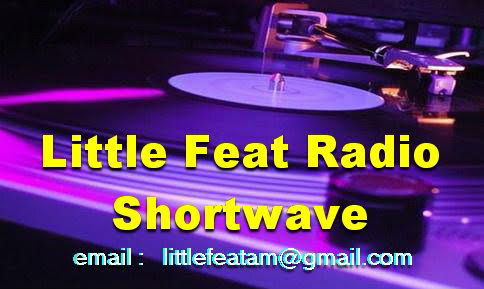 6240 0938 Coast FM 35434 “Crazy For You” by Let Loose, low modulation? This is a shortened version of the flier that Bob sent me about the new version of DXtreme software for logging. DXtreme Software™ has released a new version of its popular logging program for radio monitoring enthusiasts: DXtreme Monitor Log 11. Monitor Log 11 lets listeners and DXers log the stations they’ve heard using advanced features that can enhance their monitoring experience. 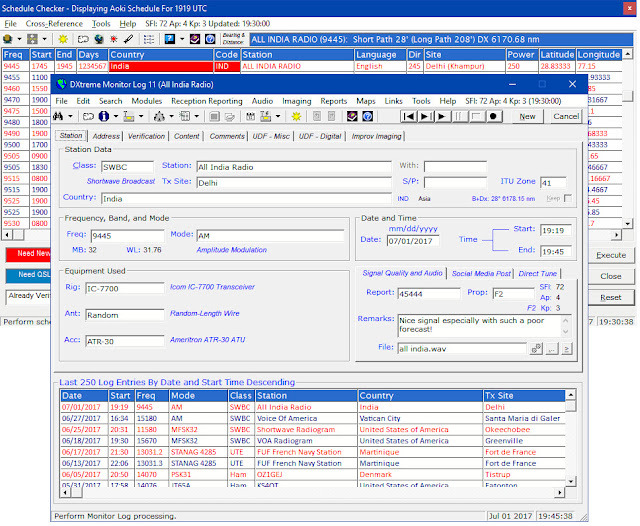 The Schedule Checker™ lets users import schedules from Aoki, EiBi, and FCC AM web sites and display schedule data according to the filter criteria they specify. 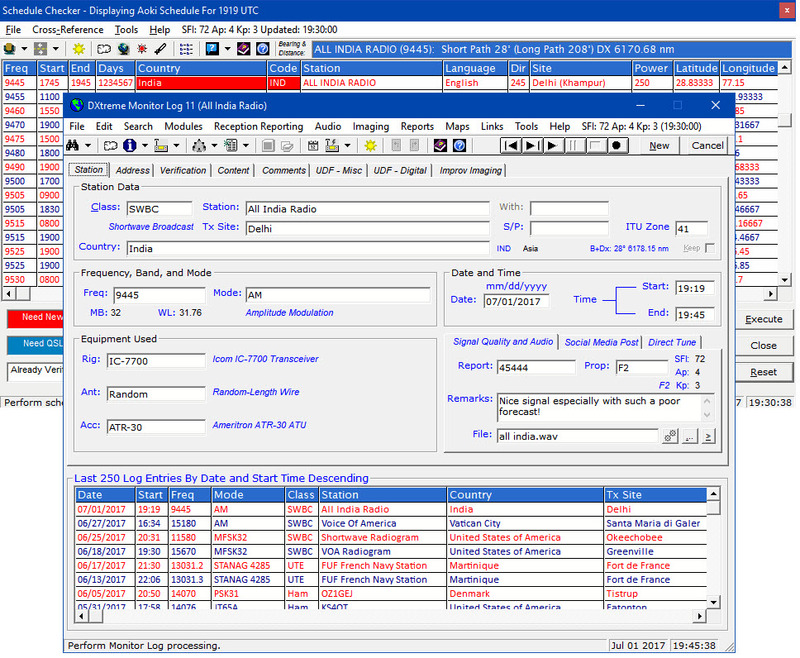 A list box lets users switch between schedule types, and depending on the schedule type selected, users can filter schedule information by band, frequency, station, country, city, state, time of day, language, antenna direction, and target area. wave, to short wave, and beyond. DXtreme Monitor Log 11 runs in 32- and 64-bit versions of Microsoft® Windows® 10, 8.1, 8, 7, Vista®, and XP. It retails for $89.99 USD worldwide for electronic distribution. Pricing for CD versions and upgrading users is available on our Web site. All prices include product support by Internet e-mail. For more information, visit www.dxtreme.com or contact Bob Raymond at bobraymond@dxtreme.com. Due to my Cancer condition (non-Hodgkin Lymphoma) that was diagnosed in February 2017, I regret to tell you that EMR will be off air until further notice. I hope to return EMR to the air at some Point in 2018. PS. More Pages to our Website will be added over the next few Months while EMR is off air!" Wolverine was very strong for a USA station prompting doubts that it may not be direct. However, listeners reported the same programme being carried on 6940U via SDRs in the US. Third time this week I have heard Clever Name Radio. I could alos hear something on around 6922 in USB, but not enough to ID. BSR was testing today on 15050U.. maybe it will be on over the HF weekend. The idea behind the Global HF Weekends are to promote friendship through radio around the world. 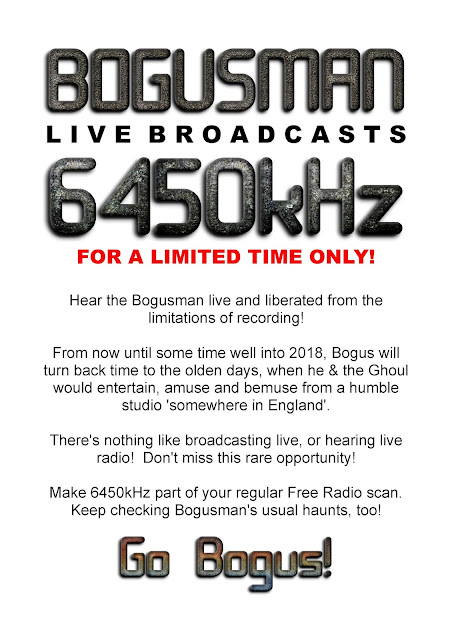 The hope is that listeners will be able to hear different stations and for broadcasters to reach distant locations. Anyone may participate. I've already heard from a few stations who plan to broadcast and I've been in contact with a number of listeners. The last one, which occurred during the first weekend of April, resulted in some success with intercontinental broadcasting. Four North American pirates all operated around 0600 UTC between 6920 and 6950 kHz and were heard in New Zealand. A South American station ran 24/7 tests on 6930 kHz across Global HF Weekend and was reported in Germany, Maryland and Pennsylvania, and South America with only 10 watts. One Dutch station was logged in Pennsylvania, Rhode Island, New Jersey, Massachusetts, Michigan, Kentucky, New York, Maryland, and Virginia. Other stations were active specifically for the weekend, but just for a local or regional audience. 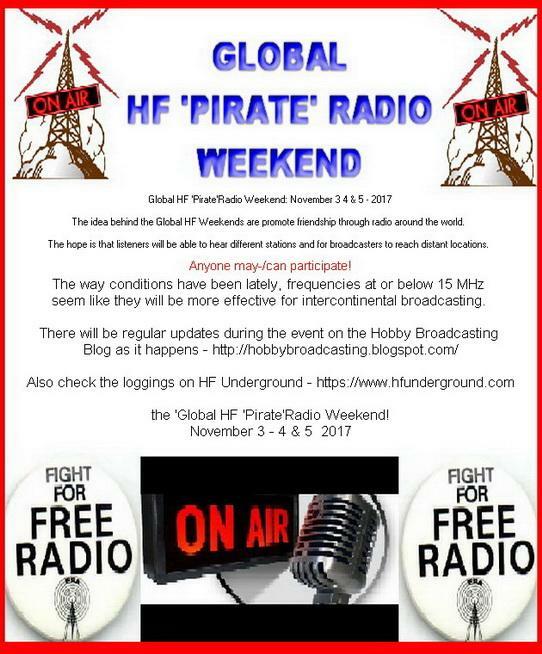 Of course, these were general frequency ranges used by pirates during prior Global HF Pirate weekends. Some stations will surely operate on frequencies and times outside of these ranges. In fact, the way conditions have been lately, frequencies at or below 15 MHz seem like they will be more effective for intercontinental broadcasting. 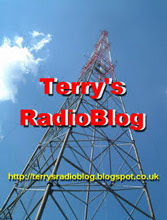 Note from Terry: Already this week some USA stations have been heard in Europe. I have heard Clever Name Radio on or around 6950U on two occasions in the past week. Let us hope for stable conditions this weekend. NPO R1 from Goes on 104.4 mHz (FM) in the Netherlands. Q Music on 100.7 mHz, which could have been one of 4 transmitters from NL. Listeners from West Norfolk to BBC Radio Norfolk complained of not being able to hear their local station because a Dutch station was there instead! 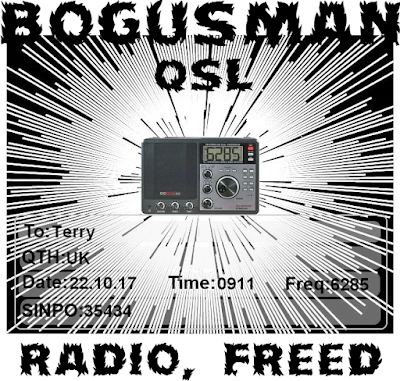 QSL for reception of Bogusman on Sunday the 22nd of October 2017 at o911 UTC on 6285 kHz. 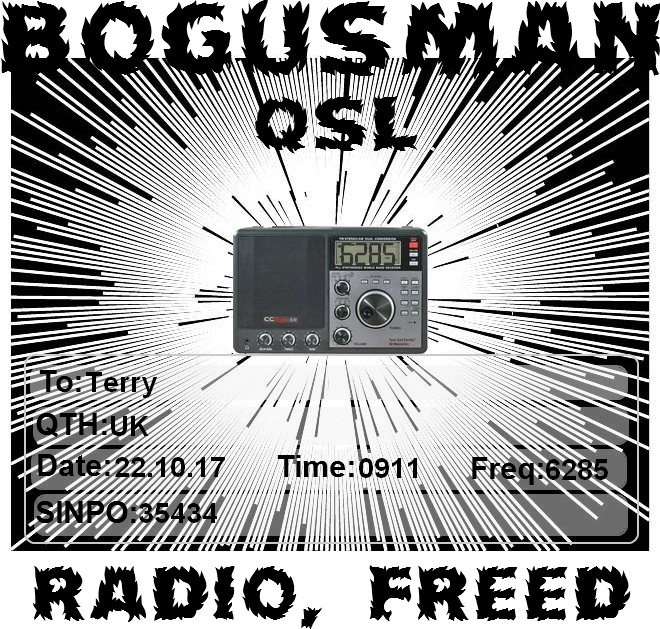 Thanks to the QSL helper!